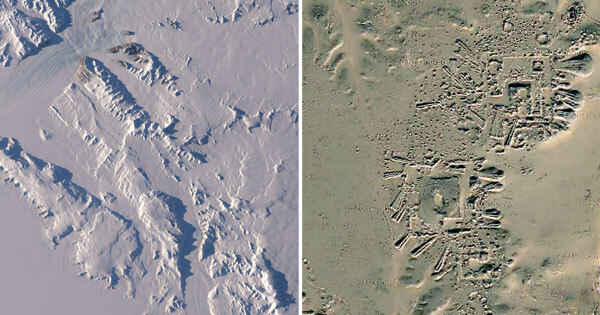 4 Comments on "Antarctica: NASA Images Reveal Traces of Ancient Human Settlement Underneath 2.3 km of Ice"
It is interesting that people don’t publish the geographic coordinates. How lame is that? can’t be more than 5000 years old. the idiot bible tells me so. A pole shift occurred during the melting of ice over North America and other areas during the last ice age melt. The sheer weight of a layer of 2 miles of frozen ice melting to the sea caused an imbalance that could have caused a movement knows as crust displacement. This creates a “chicken or the egg” discussion. In other words: Did the ice begin to melt and cause crust displacement or did a comet strike the earth and cause the pole shift? There are many books on the subject. Read Charles Hapgood’s map research and 9500 B.C. in addition to several books from Graham Hancock.